Cyprus Comic Con has the honour of announcing Rumen Petkov, animator and director of Cartoon Network’s Johnny Bravo and Dexter’s Laboratory, as one of our Special Guests for CCC17! Rumen Petkov was born in Sofia, Bulgaria in 1948. After graduating from Sofia Art School in 1967, he began his career as an animation director at the Boyana Animation Studio. He also obtained a Masters of Literature from the University of Sofia in 1978. He became one of the main contributors to Bulgarian comics magazine DUGA (“Rainbow” 1979-1992), which was loved by several generations of Bulgarian children. His most famous comic creations are the characters “Choko” and “Boko” from the popular 70’s and 80’s cartoon ‘The Adventures of Choco the Stork and Boko the Frog‘. While working at the Boyana Animation Studio, Petkov directed over fifty short animation films, including ‘Friends of Gosho the Elephant‘ (1968), as well as the first Bulgarian full-length animated movie, titled ‘The Treasure Planet‘ (1982). 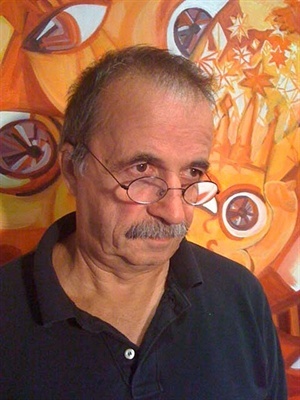 He was awarded the Grand Prize at the Ottawa Animation Festival and the Palme d’Or at the 1985 Cannes Film Festival for the short film, ‘Marriage‘ (1985). His film, ‘Monkeys‘ (1981) was named one of the ten best animated films in the world at the Hiroshima Festival in Japan. Petkov continued to direct films in Bulgaria up until 1990 when the Animation Film Studio ‘Sofia’ closed down. This caused him to move to Los Angeles with his family, in search for new opportunities. He began working for a small studio called ‘Animation Cottage’ focusing on 30-minute films for ABC television and subsequently worked for Warner Brothers, Universal and Klasky Csupo. In recent years, he worked as a writer, storyboard artist, animation director and director on episodes of Cartoon Network‘s popular animated series ‘Johnny Bravo‘, ‘Dexter’s Laboratory‘, ‘Cow and Chicken‘ and ‘I Am Weasel‘. Furthermore, he helped revive classic characters such as Tom and Jerry in the animated film ‘Tom and Jerry Blast Off to Mars!‘ (2005) for which he was an animator and timing director, as well as Woody Woodpecker, in Universal Cartoon Studios‘ ‘The New Woody Woodpecker Show‘ (1999-2002). He was also one of the artists for Nickelodeon‘s popular animated series ‘Rugrats‘. Other than animation, Petkov enjoyed working in graphic design and illustration, but his true passion had always been painting. His work has been presented at national exhibitions in Sofia and at the Biennale in Luca, Italy. Visit this page for samples of his traditional art. will there be any of rumen petkovs work at the con?